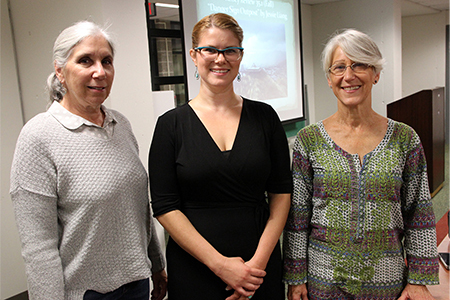 MCCC Assistant Professor of English Jacky Vogtman, center, is Kelsey Review’s editor. Long-time co-editors include Ellen Jacko, left, and Roberta Clipper. Not pictured: Luray Gross. West Windsor, N.J. – Kelsey Review, Mercer County Community College’s (MCCC’s) literary journal that went fully online this fall has just posted its Winter 2016 edition. The new issue features art, poetry, and prose from contributors who live, work and study in Mercer County. This issue features photography by Adnan Shamsi, fiction by Arlene Feldman, Tim Waldron, Nancy Demme, and Katie Zurich, poetry by Wanda Praisner, Beverly Mach Geller, Lavinia Kumar, and Vida Chu, and a nonfiction piece by Babette Levin. Says MCCC English faculty member Jacky Vogtman, editor of Kelsey Review, "We share these pieces of prose and poetry crafted by talented Mercer County-area artists to bide you through the winter months ahead. Read. Re-read. Share with friends and family. Take this healthy dose of literature to cure you of all life’s ailments." Links to the current issue, as well as to issues that date back to 2009, when the print version of the journal was first posted online, can be found here. The editorial board also includes fiction editor Roberta Clipper, Professor of English at Rider University; poetry editor Luray Gross, a poet and storyteller who works as an Artist in Residence in New Jersey and Pennsylvania; and poetry editor Ellen Jacko, a retired English teacher from Allentown High School. Kelsey Review welcomes new friends on its Facebook page. The editors invite the community to “like” the page and add their comments about the material in the journal and the arts in general. Submissions for all quarterly issues are accepted online between January 1 and May 31 in the following categories: fiction, non-fiction, poetry, art, photography and reviews. For submission details, email Kelsey.review@mccc.edu or visit the Kelsey Review website.